Clever and interesting way to discuss a subject that many families face. Dennis and his cousin Mellie both want a dog and have been emailing each other about what kind of dog to get. 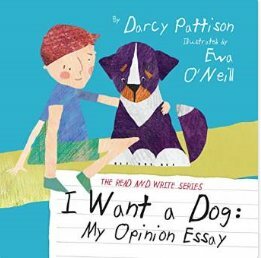 Now Dennis has been assigned a school essay to write about what kind of dog would be best for his family. Mrs. Shirky informs Dennis that he must use criteria (reasons) to explain his choice. As the story continues, Dennis compares his criteria including size, energy, attention, exclusivity, training, grooming and others with the needs of his cousin, which are very different from his. At the end of the book the reader sees the essay Dennis wrote as well as the choices and names that he and Mellie picked. Lots of illustrations accompany the text as well as names and pictures of the most popular breeds of dogs. Teachers could use this book as an interesting way to generate interest and jump start a personal essay lesson. While the pictures and concepts are simple, the actual writing lesson is more suitable for children in second through fourth grades. Parents who are contemplating adding a canine to their family could also use this story as an incentive to guide their final choice. I love books that sneak in lessons about writing! 🙂 Thanks so much for sharing this wonderful review at Booknificent Thursday this week! Yes! A sneaky little trick that parents and teachers can use to jump start writing for children who lack motivation or who are reluctant to express themselves.